Lacunas, or semantic lexical gaps, are words whose meanings cannot be concisely translated into other languages. Some, like the Italian culaccino, refer to specific, tangible things – in this case, the mark that a cold glass leaves on a table. Others refer to emotions so particular that one experiences a kind of epiphany upon learning them. Oh, so that’s what that’s called! There is something deeply comforting about realizing that there is a word for what one has felt all along. Often lacunas cause us to feel lonely and strange, as if we are the only ones in the world to feel a certain way. 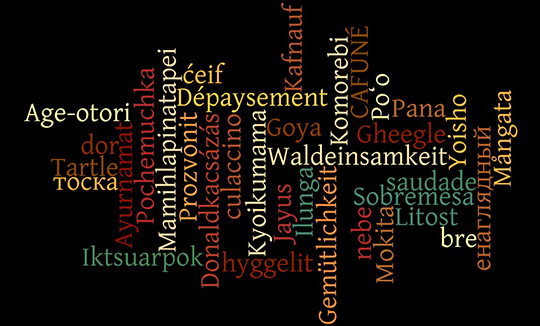 Untranslatable words offer a way to bridge those linguistic and psychological gaps. I also love words like the Swedish Mångata, which refers to the shape of the reflection of the moon on water, or the Japanese Komorebi, which describes the sight of sunlight filtering through trees. These words are entire poems contained just in a few syllables. The related, but very different concept of “Litost” is prominent in the Czech writer Milan Kundera’s novel The Book of Laughter and Forgetting. This raises the question: if we were never to learn the word Litost, as, presumably, many people never will, would we fundamentally misunderstand the human soul? If we never learn the word Toska, might we never comprehend our own complex gradations of pain? Sometimes it is not the vocabulary, but the grammar of another language that renders it difficult to translate. Nadezhda Shevchenko (BA2) explained that the Lithuanian prefix “nebe” means “no more” as in “I am no longer eating” or “I am no longer a teacher.” Even more fascinating is that Lithuanian does not distinguish between “who” and “what” because of a persisting belief that everything is endowed with a spirit. Untranslatable words point to a kind of universal cultural aphasia. Does this mean that to better understand ourselves and the world around us, we ought to learn as many languages as we possibly can? In any case, I asked other students at Bard College Berlin for their favorite untranslatable words. Niv Segev (BA2) explained the Hebrew term “Kafnauf” as a person who gives very convincing, but very bad advice. Lucas Møller (BA1) described the Danish word “hyggelit” as “like cozy… but better.” It’s a social term, one associated more with hot cocoa than with beer. It’s similar – but not quite the same – as the German word ‘Gemütlichkeit’ or the Dutch word “Gezelligheid,” which one student described as “The feeling you get when you arrive at the bar and all your friends are already there.” It’s a delightful concept, but not an unserious one. In 1973, an English solicitor was awarded damages after a trip to the Swiss Alps failed to provide the ‘Gemütlichkeit’ promised by the resort’s brochure. As far as I know, there is no single word, in English or any other language, that describes that feeling.